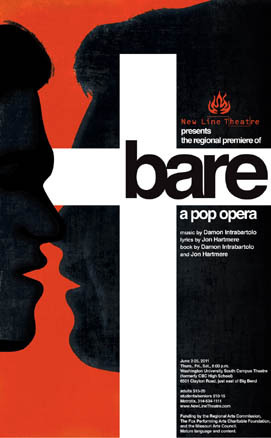 I have been continually blown away by the sophistication, craft, and complexity of the bare score. The harmonic language is so unique, living entirely in the musical vocabulary of pop music and alternative rock, but crafted with a confidence and fearlessness and freshness that is very exciting. Unlike most conventional musicals, in the bare score phrases aren't always in multiples of four bars; many songs do not end on the tonic chord the way almost all Western music does; there are lots of ambiguous open-fifth chords, missing the note that makes a chord sound either major or minor, happy or sad; and this music often screws around with the rules of harmonic progressions, surprising our ears but never so much that our ears rebel. To the untrained ear, the score sounds like great pop music. To the trained ear, composer Damon Intrabartolo’s music is just as unique and surprising as the music of Bill Finn (Falsettos, Spelling Bee, A New Brain) or Tom Kitt (High Fidelity, Next to Normal). Structurally, Intrabartolo and lyricist Jon Hartmere use the vocabulary of opera – arias, recitative, leitmotifs and themes, choral work, lots of complex counterpoint – but all within the harmonic and melodic world of American pop and rock. It's a neat trick they’ve pulled off, giving these young characters the right musical voices while giving their drama a powerful underlying musical structure. But none of this is why bare is so special or why it resonates so powerfully with so many tens of thousands of young people across our country. Perhaps the reason for its power and its popularity is its honesty. Since the 1960s, the true test of rock and roll is authenticity. And bare has that in spades. It is truthful about being young in America at this moment in time like very few other musicals are – with the possible exception of the extraordinary American Idiot. Even at my age, I see myself in almost all these characters and their potent, painful emotions. A few years ago I was noticing that we were producing fewer specifically gay-themed shows than we had in the past, and I wondered if maybe the gay community had come so far that gay Americans don’t need “gay theatre” the way they did in the 1990s. After all, gay marriage is slowly spreading across the country now, Don’t Ask Don’t Tell is ending, and there are many other positive signs. But at the same time, every five hours an American gay teenager kills himself and twenty others try. And just last month, Tennessee passed a new law literally forbidding teachers to even acknowledge that gay people exist. Things are better today than ever before, but there are still miles to go before we sleep. Maybe bare can help a little.